The series began inadvertently during work on a separate project related to documenting sites of Kyrgyz epic poetry in the remote region. "When you are in this desolate country with such high mountains but no industry per se, it is not uncommon to drive for several miles and not encounter any people," Professor Morton recalled. "So it is astonishing to suddenly see what looks like an ornate city in the distance. After two and half hours of driving, you realize that you are approaching a cemetery. I was transfixed by the illusion. I would shout, 'Stop the car!' so that I could take pictures." Her fascination led her to extend her stay that summer of 2006 and return twice more the following two summers. The carefully composed images include many long views that situate the cemeteries in their natural context. "I was looking for the relationship of the city of the dead to the landscape because the mountains are so dramatic and compelling," Professor Morton says of her compositional approach. Photography has long been her principle artistic practice, but she says she takes a fine arts approach to the discipline. She has taught at the School of Art since 1980, teaching photography, foundation two-dimensional design, and "Art of the Book." She points to one image, enlarged for the show and used as the cover of the book. It depicts a large cluster of stone and brick buildings, all different and rather ornate but devoid of people, nestled in the undulating, treeless surroundings. In this context you lose all sense of scale. "I found the sharply pointed tops of the structures reflective of the cragginess of the mountains," Professor Morton says. "Yes, there are Islamic references but they also resemble the mountains in form. I had this theory that the builders were instinctively responding to the landscape. Structures with rounded tops show up more in regions where the landscape is rounded and hillier, for example. But the Kyrgyz scholars I spoke to about it had not considered this possibility." 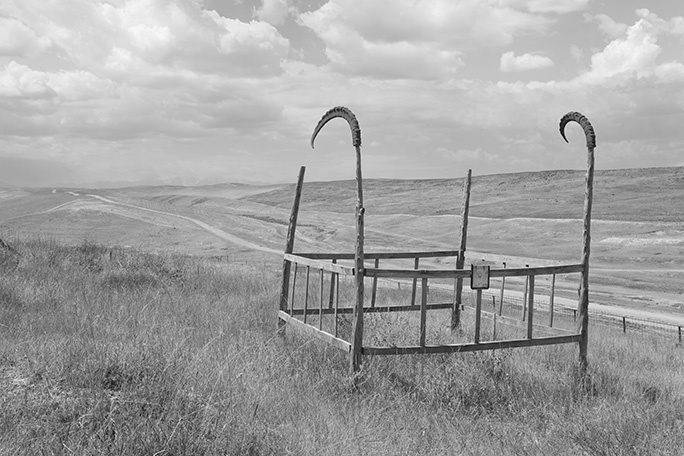 The cemeteries are all untended and slowly decaying as the Kyrgyz people honor their ancestors with generous funerary displays, but custom and superstition puts the cemeteries in remote locations and generally unrevisited. The closer views reveal fascinating cultural juxtapositions. The various symbols used for decoration conflate Islam with Soviet communism, Eastern European enamel portraiture and pre-Islamic animism in the form of animal skulls, horns and tails. One of Professor Morton's favorite images is of a single grave on a hillside, marked by a rough-hewn wooden fence with an antler on each of the two forward posts. An empty road meanders off into the horizon. "The starkness and simplicity seem quite modern," she says. "This is one of my favorites too," Professor Morton says, pointing to an image where the mountains are obscured by clouds. In the foreground are what look like birdcages on a hill. "These metal structures are designed to replicate the yurt, the traditional dwelling of the nomadic Kyrgyz. Yurts are still used to house herders and their families as they move to higher pastures throughout the summer months. They are also constructed outside the home of the deceased during the funeral ceremony. 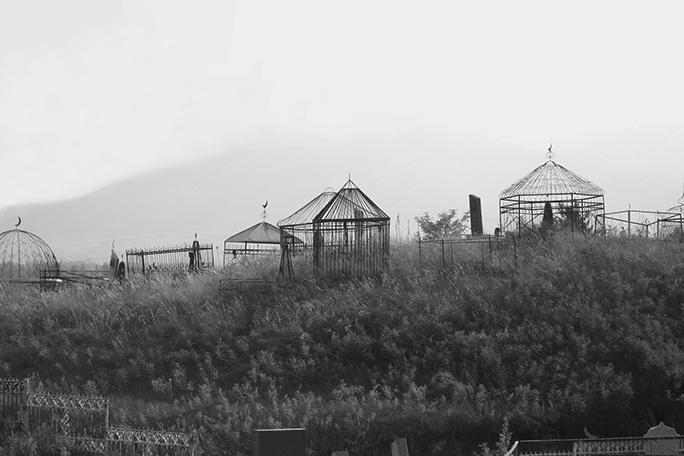 The metal yurt monuments typically mark the tombs of women, who traditionally maintained the yurt. To visitors, the yurt monuments are reminsicent of empty birdcages, a pervasive metaphor in many cultures." The "Cities of the Dead" series stands apart from Professor Morton's larger oeuvre in terms of its content while still dovetailing with her larger artistic themes and concerns. Her past published works focused on the temporary structures built by New York City's homeless individuals. "My four previous books were all based in Manhattan and the photographs reveal a very different sense of place and quality of light. One project was entirely photographed in an underground tunnel. Kyrgyzstan is a high-altitude country and I usually was photographing above the tree line. The text for my previous books was based on oral histories, which I had considered a major part of my work. But these cemeteries are not peopled." Yet, she says, "My focus in all my work has been alternative-built environments. Spaces built by non-architects. I was very impressed as an undergraduate by the book Architecture Without Architects, by Bernard Rudofsky. It was very controversial when it was first published. The architecture students in the class were quite conflicted by the book, but I was fascinated by it and started considering architecture in a much larger context. These cemetery monuments typically are built by the family or friends of the deceased, but not architects." While they appear timeless, or, thanks to the Soviet iconography of hammer-and-sickle decorations, trapped in another era, careful examination of the images reveals details that bring them up to the moment. "I have three photographs in the book of monuments that have been desecrated," Professor Morton points out. 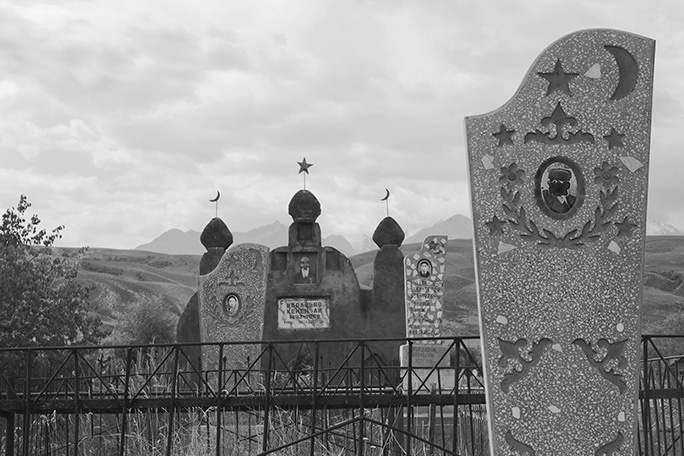 "According to Kyrgyz anthropologist Dr. Elmira Köchümkulova, who wrote the introduction to the book, in the last 20 years, with the increasing influence of fundamentalist Islam, there has been growing tension in Kyrgyz society about building tombs on Muslim graves, as Islam discourages tombstones or decorative markers. In this particular cemetery, the eyes of the portraits were chiseled out or the portraits were removed entirely." Dr. Köchümkulova predicts that the style of cemetery that Morton has documented may soon become a thing of the past. 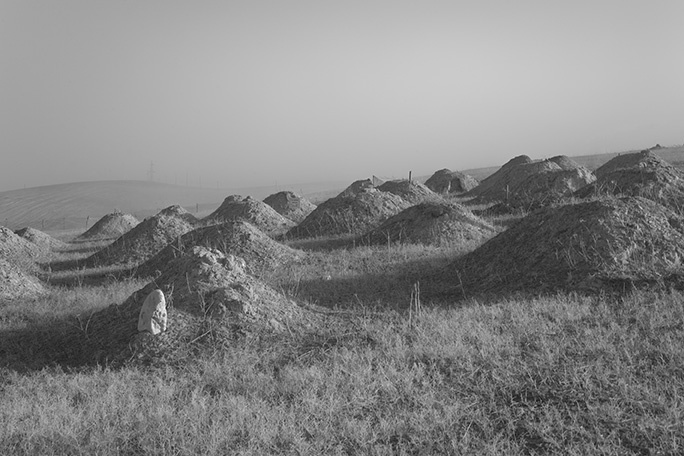 "She tells me that increasingly the Kyrgyz are just covering the graves with mounds of earth," as you can see in a few of the images in the exhibition. "She wonders what will become of the cities of the dead in ten years, because it is Kyrgyz tradition to allow these monuments to eventually disappear back into the earth." In this way "Cities of Dead" may become the final record of a rapidly crumbling cultural expression. 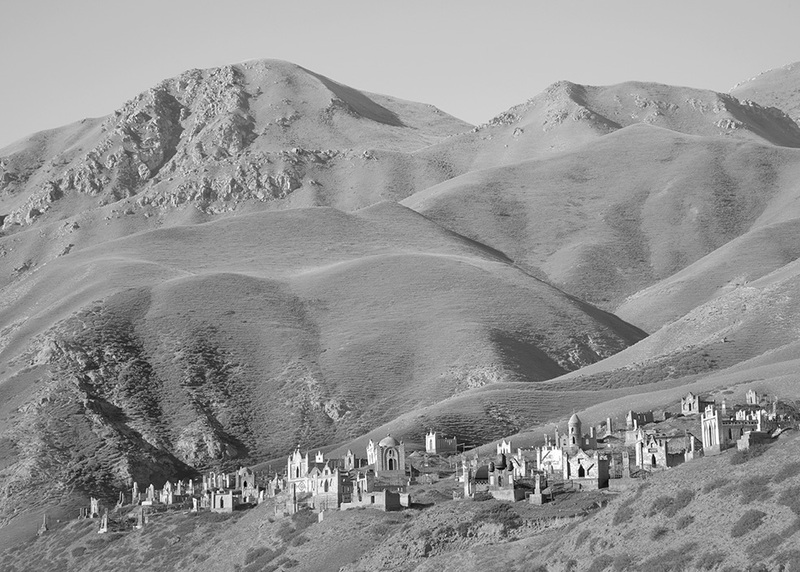 A "city of the dead"
During the summer months of 2006 - 2009 Margaret Morton, professor at the School of Art, visited Kyrgyzstan, the mountainous region of Central Asia, to photograph the mirage-like cemeteries. 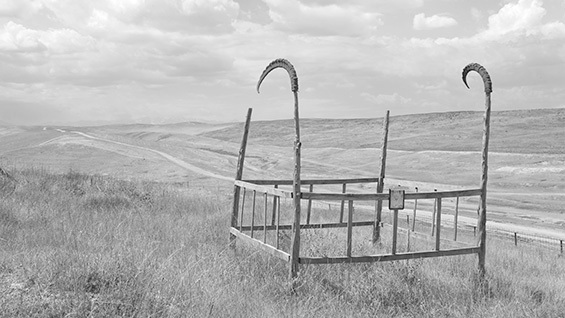 A collection of those photos, Cities of the Dead: The Ancestral Cemeteries of Kyrgyzstan (University of Washington Press) was published in 2015 and an accompanying exhibition opened at the Arthur A. Houghton Gallery at The Cooper Union in February. Here is a small sample of those images. All photos are courtesy Margaret Morton.